Affix either vertically or horizontally for double the display options. 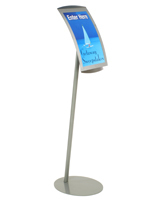 Fixture stands at eye-level to easily grab a customer's attention. 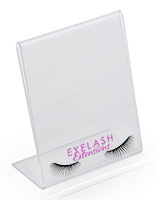 Non-glare lens covers graphics and keeps them in place with a magnetic border. 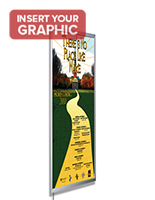 This metal, magnetic frame is a great sign holder for displaying sales promotions. The unique design of this sign stand will cause passersby to stop and take notice. This magnetic frame can be used to welcome clients into your store or restaurant. The relatively small footprint of this fixture doesn't consume much floor space. You can even find this curved sign, magnetic frame in a restaurant entry way, showcasing the menu or the "special of the day." 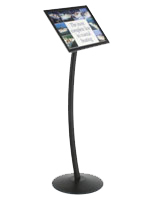 Retail stores and business offices alike, use this sign stand to keep visitors and patrons informed. 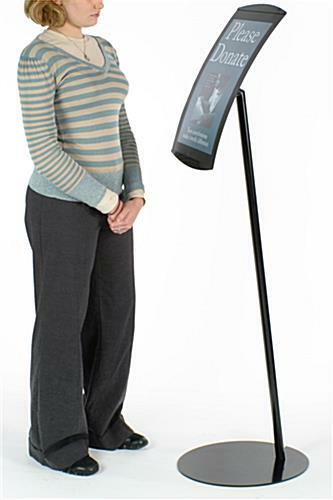 This magnetic frame, also known as a sign holder, stands almost 5-feet tall; a great eye-level height ensuring it will be noticed. 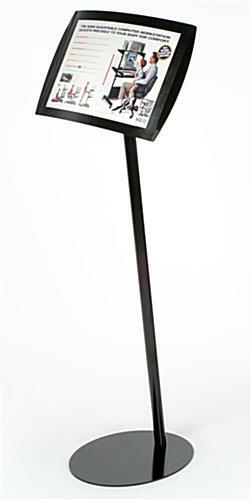 This sign post ships unassembled, thereby saving on shipping costs. 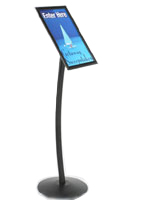 Each floor-standing display, magnetic frame, is made from anodized aluminum and has a sleek, black finish for a professional-looking fixture. The neutral black color will complement the signage on display as well as the surrounding décor. 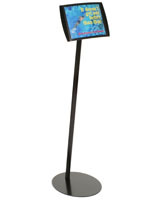 This floorstanding sign holder, magnetic frame has a flip-open lens to protect graphics. It also makes switching them out a simple task! The non-glare lens has a magnet around the border to keep advertisements in place and keep them protected. This convex magnetic frame, such as our curved frame, holds a standard-sized 11" x 17" graphic. 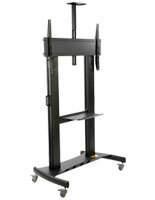 You can even mount the frame either horizontally or vertically! Keep customers interested by constantly updating your display! This sign holder is a durable magnetic frame, developed to withstand everyday wear-and-tear within any high-volume, indoor environment. 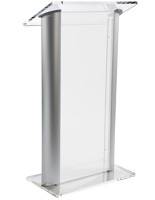 This stand is so durable and much stronger than others we have purchased. The display sign area is large with much stronger magnetic covers. We highly recommended these!! Good customer service also when one sign was shipped with a part missing.